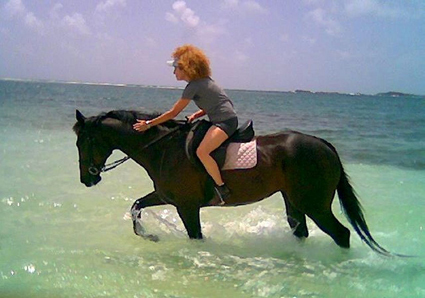 I am a 50 year old woman who started riding 4 years ago and owns a 7 year old thoroughbred horse since 3 years on the island of St. Martin in the Caribbean. My horse Atid and how he came to be here with me is a story in itself ! Horseback riding has blessed and changed my life forever. The story that you are working on telling really touches my heart and I can see myself still riding at 101 years old like Connie. Good luck with your project. Elisa, good on you for living your dream and taking up riding! I would just like to compliment you on the beautiful condition of your lovely Atid. you look very happy together – and the sea is gorgeous! Donald McCormick: "This is My great grandma as we..."
Gavin Mahaloo: "I know trick riding is difficu..."
Javier Gonzalez: "The first job I held in the be..."
Karen Doris Wright: "I and my sister Barbara attend..."